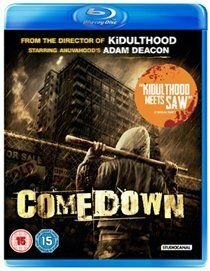 A group of inner city teens are hunted down by a crazed psychopath, in this slasher horror from director Menhaj Huda. Although he's determined to change his life around now that his first love Jemma (Sophie Stuckey) is pregnant, recently released con Lloyd (Jacob Anderson) soon finds himself running with his old mates again. Accepting their offer of cash and drugs, he agrees to help them break into the now derelict tower block where they used to live as kids and erect an aerial for their pirate radio station. With Lloyd's friends deciding to celebrate his release at the same time, the event soon turns into a party with the group popping pills like there's no tomorrow. But when Jenna mysteriously disappears, the resulting search of the labyrinthine tower quickly turns into a bloodbath, as one by one the friends are targetted by a blade-wielding psychopath.